The swimming pool filter is the reason your pool water is clean and clear. The name pool filter says it all. The swimming pool pump will pump pool water through the swimming pool filter where unfiltered water passes through and clean, clear water passes out trapping almost all particulates, debris, dirt, and coagulated products in the pool filter. Pool sanitizer (chlorine usually) keeps the pool water sanitized and free of micro-organisms that can grow in unsanitized water. Perfect pool water chemistry combined with a sound swimming pool filter results in clear, blue, and sparkling pool water. 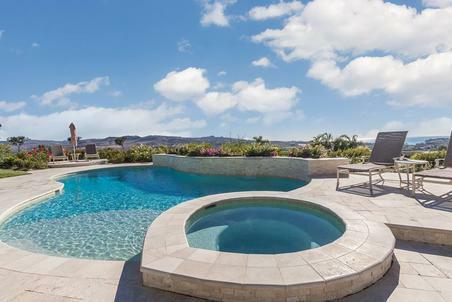 There are three popular types of swimming pool filters in California. They are sand, cartridge, and diatamaceous earth. We will refer to diatamaceous earth as d.e. from this point forward. The most popular swimming pool filter is the d.e. filter, but cartridge filters are becoming more popular, because they are considered to be the more environmentally friendly swimming pool filter choice. The sand filter is the easiest and cheapest to maintain, but offers less micro filtration compared to the other two. The d.e. 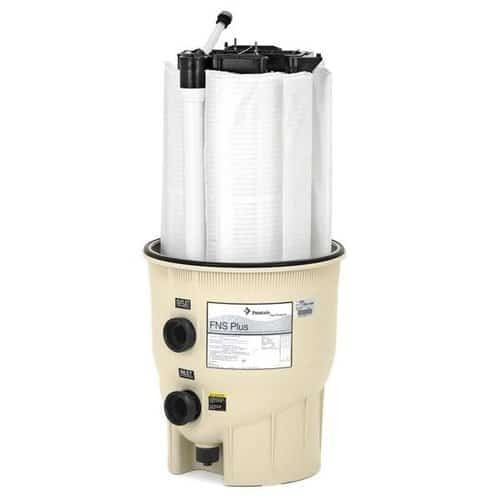 filter offers the finest, most micro filtering pool water among them all and is the most popular, so we are going to focus on it with this page. Inside the d.e. pool filter, you have a grid assembly composed of 8 grids, a grid retainer,a manifold that holds them together in formation, and a metal center rod tightened with nuts to lock them in for one complete grid assembly. Pool water will pump through the exterior of this grid assembly and clean, filtered water will flow through the cloth and d.e. into the inside of each grid and out the filter through the inside of the manifold. One of the benefits of the d.e. swimming pool filter is back-washing. Back-washing is where water flow is reversed inside the pool filter and pool water return flows out to the house sewer or other plumbing line then back to the swimming pool. Back-washing cleans the inside of the pool filter by washing out the d.e. and dirt that coats the filter grids. Diatamaceous earth coats the filter grids, so dirt and debris does not stick or cake on to the grids. Dirt, debris, coagulated particulates, and other products then get trapped by the d.e. coating the grids. Back-washing washes the d.e, dirt, and debris out of the filter and lowers the pressure inside the filter for efficient filtering. Back-washing cleans the filter without dismantling and is recommended whenever the pressure starts rising from the pressure marker you should make whenever you dismantle and clean your swimming pool filter. We will back-wash pool filters 3 or 4 times before dismantling and cleaning. Most swimming pools in California need a filter dismantle and clean once or twice a year thanks to this backwashing capability. Back-washing also helps to drain pool water in the event of overflow from rain or overfilling. We are experiencing a drought in California at the time of this writing, so please take care when filling your pools with water. Back-washing is another advantage compared to cartridge filters since they don’t have backwash valves. We always add fresh, new d.e. after a backwashing or annual filter dismantling and clean. We do this by pouring the d.e. down the pool skimmer with pump suction on (just like the picture up and to the right), so the d.e. is sucked into the filter grid assembly inside the swimming pool filter. We try to always inspect return water out of return lines after pouring d.e. down the skimmer to confirm that the swimming pool filter is capturing and holding the fresh d.e. Only swimming pool repair experts should attempt pool repairs such as a swimming pool filter dismantle and clean!! Once or twice a year in California, our swimming pool cleaning service will perform filter dismantle and cleans. We will inspect all the grids and manifold for cracking or holes. Any holes or cracks will cause dirt and debris to return back to the swimming pool which ruins our filter process. We will replace all compromised parts we find in this inspection including the tank o ring which needs replacement every year or two. A Symptom of swimming pool filter issues is noticable d.e., dirt, or debris piling up on the bottom of the pool around pool or spa return lines. This is because holes in the grid assembly will allow debris, dirt, and d.e. to pass through and out to pool return lines where they will fall down to the bottom of the swimming pool. A good test for this is to backwash your swimming pool filter and see if you notice cloudy water or tiny particles returning out your pool or spa return lines right directly after adding d.e. to your swimming pool filter.